Whatever your budget, Arequipa has the perfect accommodation for you. Party hostels are very popular in Arequipa but there are also more relaxed hostels available if preferred. You will also find many beautiful hotels in Arequipa, perfect for retreating to after a long day of exploration and adventure! This hostel has a fantastic combination of quality services & facilities while also taking the prize as the most enjoyable hostel with the best atmosphere. The staff at Wild Rover always go above and beyond for their guests and welcome anyone to join the party! 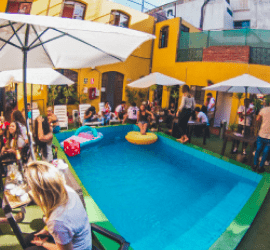 With excellent prices, the Arequipa branch of this well-known chain of hostels is our top-pick for all-round value of all the Arequipa hostels. This is the perfect option for couples looking to escape the busy city at night. With very friendly staff, you are made to feel welcome straight away. Having been open for over 15 years, the management in this hostel know exactly what backpackers want and constantly succeed at delivering it. This charming little youth hostel is perfect for travellers looking for a low-key hostel and relaxed vibes. Located just one block from the Plaza de Armas, many of Arequipa’s main landmarks such as the Santa Catalina Monastery and Juanita Museum are easily within walking distance. A great spot for guests who want to explore during the day and relax at night. Considered one of the more upmarket Arequipa hotels, Casa Andina is broken up into three different locations and includes a selection of standard, select and premium room experiences. It offers maximum luxury and comfort for a reasonable price, in very convenient locations. Perfect for guests that a place to relax after a long day of exploration. Rates for two guests a night range from $60 - $115 USD per night. This is one of the few Arequipa hotels with a decidedly old-world feel. It is a boutique hotel that consists of a beautiful colonial courtyard, old archways and ornately designed floral arrangements. This gem makes you feel like you’ve been transported back in time in absolute comfort and luxury. Standard room rates start from $75 a night but they also offer two-night, three-day stays that include rafting excursions and Colca Canyon tours. This picturesque boutique hotel is located just off the beaten track, a few blocks south of the city center. 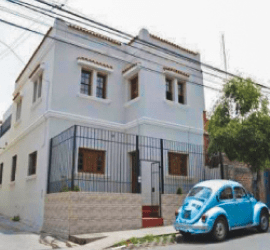 Dreams Boutique Hotel resides in the neighborhood of Vallecito, perfect for guests wishing to escape the hustle and bustle of the busy streets of Arequipa while remaining nearby. Not many Arequipa hotels achieve such a happy medium between tranquility and liveliness. The going rate for a standard room with breakfast is approximately $40 a night.